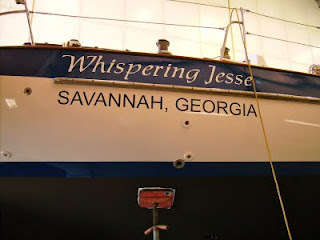 Whispering Jesse has been launched! 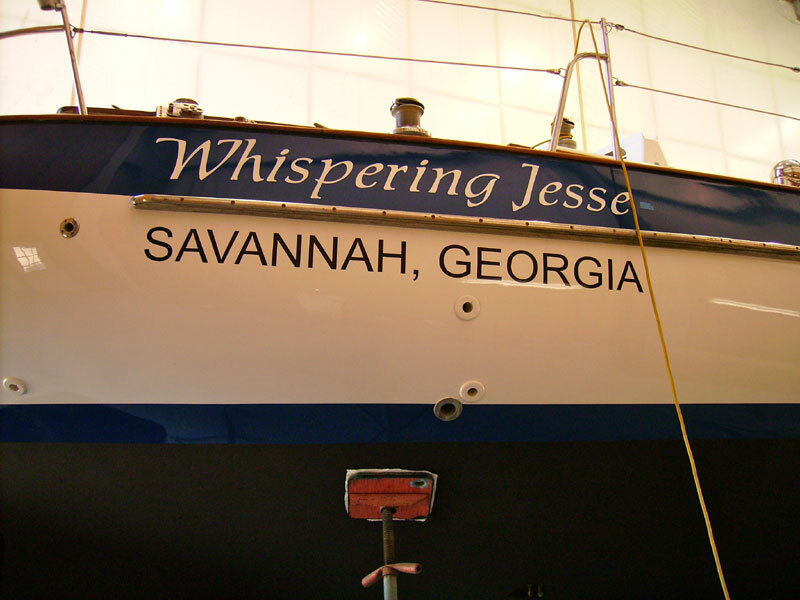 Whispering Jesse in the paint shed with her newly applied name and hailing port. Thank you, Marty! The old bottom paint was an uneven light green. The new bottom paint is black and makes the boat look like a large sleek whale. A final shot of Whispering Jesse at rest on her supports in the paint shed. The Travelift and slings are in place for the move out of the paint shed and into the water. Touching up the bottom paint out in the boatyard. Note the nicely cleaned-up folding two-blade propeller and shaft. Thank you, Chas! 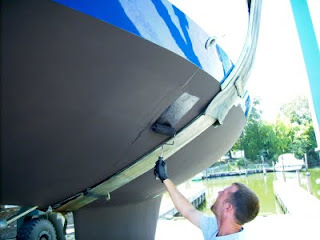 Applying bottom paint to the bare spots where the supports pressed against the hull. The launch ramp that the Travelift travels down is visible in the background. Whispering Jesse is in the water! 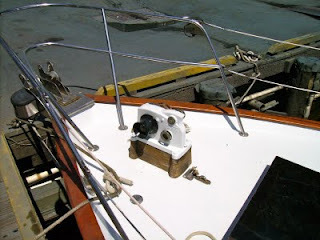 Note the nicely cleaned-up manual windlass. Thanks again, Chas! 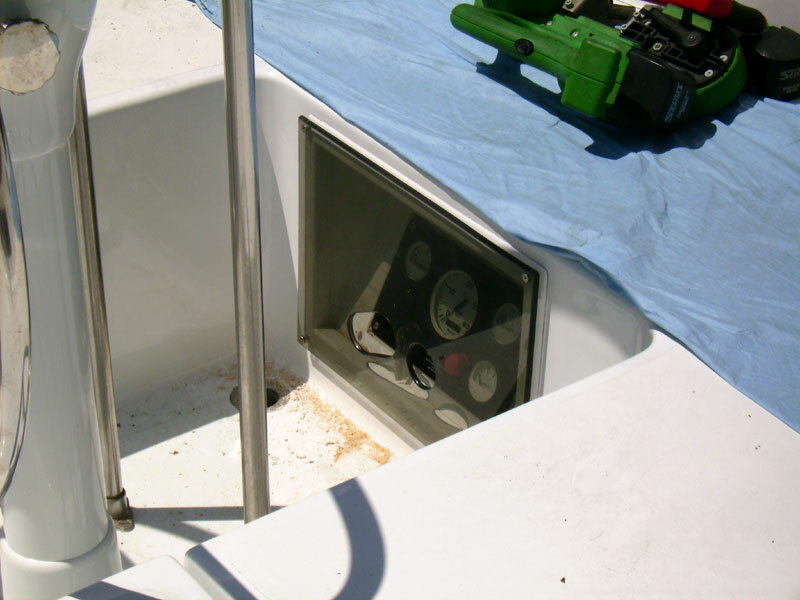 And also the new Plexiglas on the foredeck hatch. Thanks, Don! A shot of the cockpit showing the new engine panel protected by a sheet of Plexiglas. Thanks yet again, Chas! 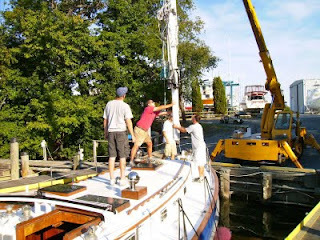 Don, in the red tee-shirt, and his crew move the mast into place. The paint shed is visible in the background. The mast in the process of being stepped. I'm guessing Don is down below moving the bottom end into position. 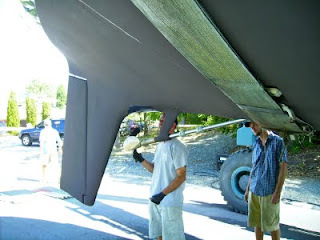 Don and crew attaching the new shrouds to the new chainplates. Thanks, Collin! Note the Valiant 42, Vespers, in the background. 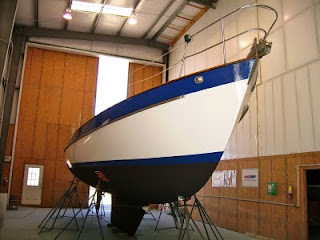 The mast and shrouds are in place, but the boom and the new lifelines still need to be installed. According to Don, Whispering Jesse will stay in this safe slip until Hurricane Irene has passed, which should happen sometime on Sunday. We're hoping it doesn't become necessary to haul out again so soon after launch. Keep your fingers crossed! John promised more photos when I get out there next week. Thank you, John! It has been a hot summer here in Grand Junction, but the thermometer didn't get up to triple digits until Wednesday. With the temperatures only in the mid-nineties and the humidity near zero, it has been reasonably comfortable to take long weekend hikes with Scout provided there was some shade and I carried plenty of ice cubes and water in my CamelBak. 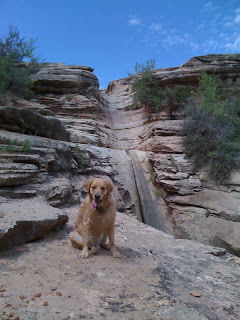 This past weekend, Scout and I drove over to the Bangs Canyon area off Little Park Road, just a few miles from home, and hiked about two miles to Rough Canyon Falls, an intermittent waterfall in a pristine sandstone canyon. There are two ways to get to the falls from the Bangs Canyon parking lot, and we had tried the more scenic Rough Canyon route a couple of weekends earlier without success. There had been a fair amount of rain, and the scoured floor of the canyon had held it in muddy pools that required skirting around the edges over some difficult boulders, at least for me. Scout waded and swam through many of the pools, but I didn't want to risk a fall on the slippery bottoms. We finally reached a point where I would need to scramble down a steep pitch using both hands and feet, and I decided we should turn around. Scout might have made it down, but he wouldn't have made it back up. As we backtracked, I noticed one of those brown fiberglass stake signs. I hadn't seen it earlier because we had been on a different track of the braided trail. It warned against defacing the site, which I took to mean that there was something worth seeing along the short spur leading away from the sign. Sure enough, on a sandstone face beneath a huge overhang, there were some impressive petroglyphs of humanoid characters and a design of circles that reminded me of the map petroglyph in Hidden Valley, south of Moab. 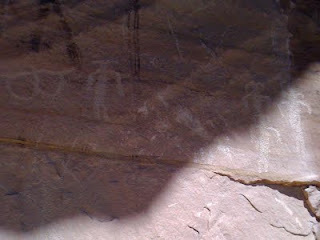 Of course, against the wishes of the sign, there was graffiti all around the petroglyphs. I don't understand why people can't just leave well enough alone. That day, we could have continued back to the trailhead and taken the easier canyon rim route to the falls, but we opted to continue up the canyon past the turnoff to the parking lot and do the Mica Mine hike instead. Nan and I had done it once a few years ago with Charlie and later learned that we had turned around before reaching the actual mine, thinking that the large piles of mica tailings we spotted were the mine's remnants. I wanted to see what we had missed, and we still had plenty of water, so off we went. The trail was really just an old jeep road that the miners had painstakingly forged through the canyon. It was easy hiking and there was plenty of shade. Within a half-hour, we had passed the tailings and reached the actual mine, which is more of a large, excavated cave. There were still plenty of mica extrusions covering the walls, and I wondered if the miners had been trying to extract it in certain-sized plates, because there were fingernail-sized pieces of mica covering the ground all around the mine. I put a piece in my pocket, took photos of Scout, and then hiked out. The rim route to Rough Canyon Falls, which doubles as a four-wheel drive slickrock road, delivered us to the falls without difficulty this past hot and sunny Sunday. Scout and I got a late start, and there was little shade, so we were happy for a slight breeze and a downhill course. I had hiked to the falls with Scout a couple of years ago because I had heard that there were petroglyphs and moqui steps to be seen, but we had seen only the falls themselves, though we carefully searched the area around the top of the falls, which were not flowing that day. I had mentioned this hike to Kelly, my guitar instructor, and he had said that there were indeed petroglyphs and moqui steps at the falls; we must have missed them somehow. I tried to remember exactly where Kelly had said the sights were located as we hiked the two miles to the falls, but I couldn't. He had made their location sound so obvious, I figured we would find them easily. Well, I was wrong. The rim route dumps hikers at a spur that takes them to the top of the falls, just like the canyon route does. Scout and I searched that area thoroughly without finding anything noteworthy except for some nice muddy pools for Scout to cool off in. We worked our way down as far as we could, to the place where two old cottonwood trunks are wedged together in the narrow slot of the falls, and figured that if there were going to be any moqui steps, this is where they would be, going up the walls next to the falls. But they weren't there and the falls weren't flowing. We backtracked, looking for a way to get down to the very bottom of the falls, but it was a sheer twenty-foot drop all along the lower rim. There is a way to get down there by continuing along the rim route to where it crosses the creek bed and then hiking up the creek bed to the falls, but that was almost another mile of hiking and we were running low on water. 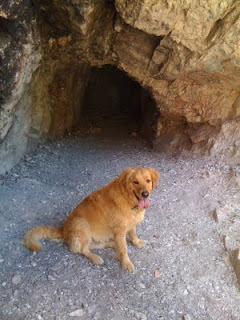 We slogged back up to the trailhead in the afternoon heat, Scout seeking shade and drinking from my CamelBak. I was thinking that the petroglyphs and moqui steps must be on the lower walls that we couldn't see from that lower rim. Maybe we'll get a cool, early morning start this coming weekend and see if we can't finally find them. I have a guitar lesson on Friday, so I'll try to get more exact directions from Kelly. Third try's the charm! First of all, let's address what is not fair. It is not fair that Americans working full-time, minimum-wage jobs are living in poverty. The current federal minimum wage, unchanged since July of 2009, is $7.25 per hour. Figuring a forty-hour work week, that works out to $15,080 per year. The current poverty level for a family of four, as defined by the government, is $22,350 in annual income. In single-parent households, where the single parent works full time, or in households with children too young to attend school, where one parent must stay home to provide childcare while the other works full time, the shortfall is $7270, almost a third less than the annual poverty level income. Obviously, there are families out there making these situations work somehow, and there are individuals working minimum-wage jobs who live with their parents or with roommates to make ends meet, which leads us to one of the biggest problems of the working poor: housing. According to the U.S. Census Bureau, "In 2007, the median monthly housing cost (rent, utilities, and garbage and trash collection) for renter occupied homes was $755." This is 40.54 percent of the annual poverty level income and leaves just $1107.50 per month for all other expenses. Remember, we are working with gross income figures here, not after-tax figures. It has become popular in conservative politics to point out that about fifty percent of Americans paid no taxes at all last year. This incomplete truth elicits indignation from those who imagine that others are not paying their fair share, but the whole truth is that many of those fifty percent do not make enough money to even qualify to pay income taxes. They may have taxes deducted from their paychecks, but they'll get the money back when they file their 1040EZ forms with the IRS. Some believe the current progressive income tax system is unfair and that it should be replaced with a flat tax of anywhere from a 10 percent "tithing" to as much as 35 percent. Imagine that your minimum-wage annual income was reduced by $2235 to $7822 for income taxes. Try reworking the housing and expense figures above with these flat-tax amounts subtracted. Now imagine trying to survive on what is left. Is it fair? Fairness depends on how you think about things. I know people who believe in their hearts that everyone gets what they deserve, that everyone is the sum of their life's decisions. My beliefs are not so black and white. People do not deserve to be poor any more than they deserve to be rich. Life simply works out better for some than for others. And some seem to have forgotten that we are all in this together. What is fair? A living wage, for starters. The minimum wage needs to be raised to a level that allows all workers to meet their basic material needs, not to live with the fear that they are just an accident or a health crisis away from bankruptcy and homelessness. If this means that the prices of the goods produced by minimum-wage workers will go up, then so be it. I started working when the minimum wage was $3.25 per hour, $4.00 per hour less than it is now, and we have managed to absorb the difference. We'll do it again. And there's a side benefit: If the minimum wage is raised high enough, then the working poor can become tax payers, which benefits their self-esteem and our national budget. The income tax system? It needs to be kept progressive, but the rates need to accelerate much more quickly than they do now, to at least the levels where they were before the Bush tax cuts, if not much more. "Trickle down" economics has not accomplished anything but to make the rich richer and the poor poorer. The rich do not spend their tax savings to benefit the broad consumer economy; they put them into investments that benefit only the few. I have owned small businesses that employed as many as four people at a time. I know from experience that tax increases do not kill jobs. Lack of demand is what kills jobs. No customers, no need for employees. The reason our unemployment rate is stuck above nine percent is because a large percentage of the people have no money to spend. Benefiting the few at the expense of the many is selfish and short sighted. We know how to fix the economy. We just need to level the playing field, because we all deserve at least a chance at a decent life. That would be fair. All the work on our 1980 Valiant 40, Whispering Jesse, must be leading up to something, right? Well, it is. We're getting the boat ready to sail away from Spring Cove Marina in Solomons, Maryland, where it has been undergoing a refit since I purchased it near Baltimore in May of last year and sailed it down Chesapeake Bay with my friend Kevin Harrison. The boat's new home will be in Savannah, Georgia, in the Delegal Creek Marina, at the southern end of Skidaway Island's golf course community, The Landings, where my parents have a vacation home. 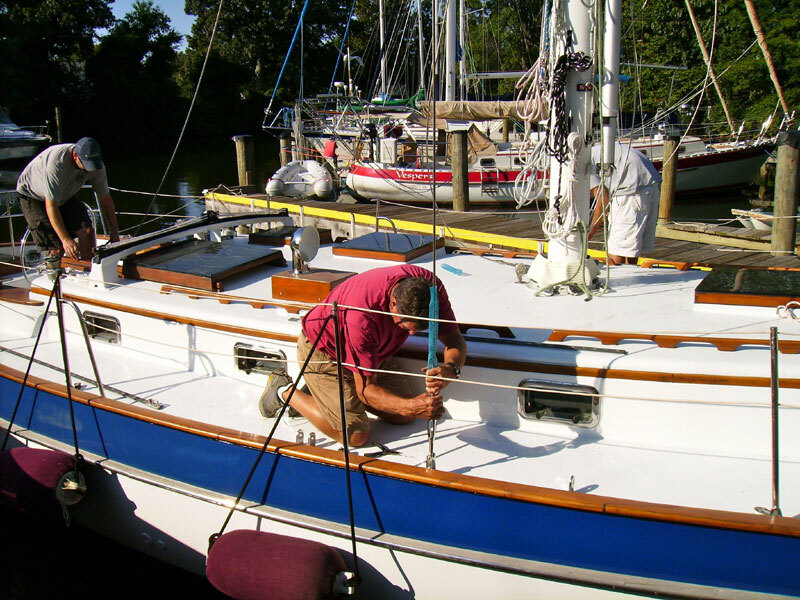 The major projects--new engine, new rigging and chainplates, new portlights, new head, new canvas and everything else--are finishing up now. Don, the boatyard manager, expects to float the boat next week after the rudder and keel are repaired and the bottom is repainted. 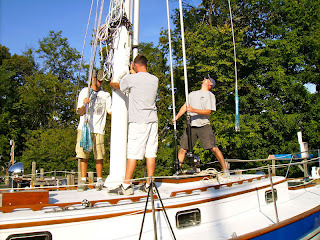 Collin, from Chesapeake Rigging, will come out and install the new standing and running rigging and the new lifelines. 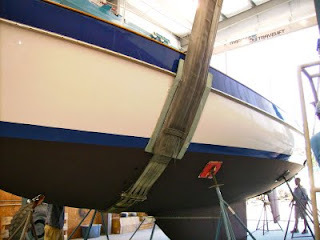 Then it's just a matter of getting the cleaned and mended sails back from Clarke at Quantum Sails and the new dodger and bimini, plus all the new interior cushions, installed by Steve at Creative Canvas before the boat will be ready for a test sail. Unfortunately, I think that first post-refit sail may happen without me. I'm sure Don and his mechanic Chas will want to put the new engine through its paces right away and make sure everything is watertight. And Collin will want to test out his new rigging. I'm fine with that if it means that everything will be ready to go when I get out there on Saturday, September 3, with my friend Mike. He and I will have plenty of details to attend to, including picking up another friend, Kurt, at the airport in D.C. before the three of us set sail on Thursday, September 8. The plan, as I have it figured in my mind and on Google Maps, calls for us to spend the first day sailing down to Deltaville, Virginia. It's only about sixty miles down the Chesapeake, so if we get a late start, we should still be arriving in daylight. 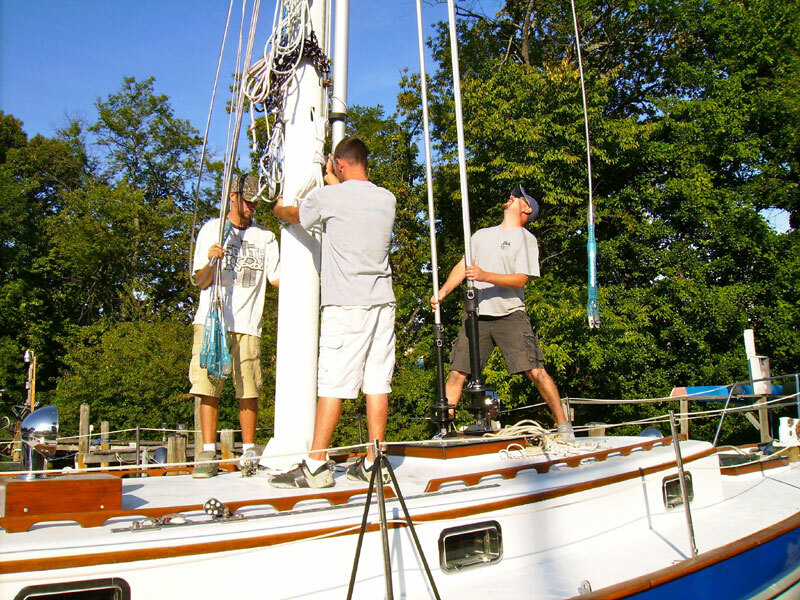 The first day on the water will be a good introduction for Mike and Kurt in how the boat's systems work and how it handles under sail. 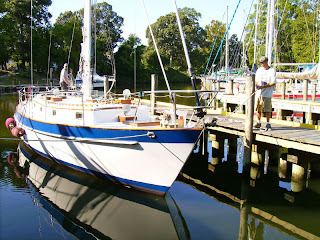 The next day, we will continue down the Chesapeake to Norfolk's Waterside Marina and spend the night there. This will be the end of our sailing and the beginning of our motoring for a few days as we pick up the Intracoastal Waterway and navigate its canals and bridges. Along the ICW, we will spend nights in Coinjock, Bellhaven and Morehead City, North Carolina. From there, we will leave the ICW for open-water sailing along the coast, with stops in Southport, North Carolina and Georgetown, South Carolina. Originally, I had planned to make Charleston the final stop before our arrival in Savannah, but there are complications. I spoke with Jimmy at the Delegal Creek Marina, and he said that high tide for our arrival day on Friday, September 16, will be just before noon, with a two-hour window on either side. That doesn't give us enough time to sail from Charleston, so I'm thinking we will need to sail a longer distance the day before our arrival and try to make it to Seabrook Island, or even as far as Hilton Head Island. 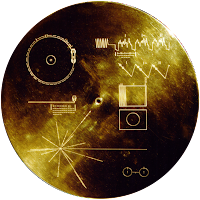 There will be plenty of opportunities during the two weeks of preparation and sailing for things to go wrong, but I've given us only one extra day to deal with any contingencies because of work schedules. We all have tickets to fly out of Savannah on Sunday afternoon, September 18, which could be cutting it close. With any luck, we will be sailing in to Delegal Creek Marina as scheduled, before the tide goes out, and meeting my relieved parents at the dock.